Is there anything that dogs love more than balls? We doubt it. 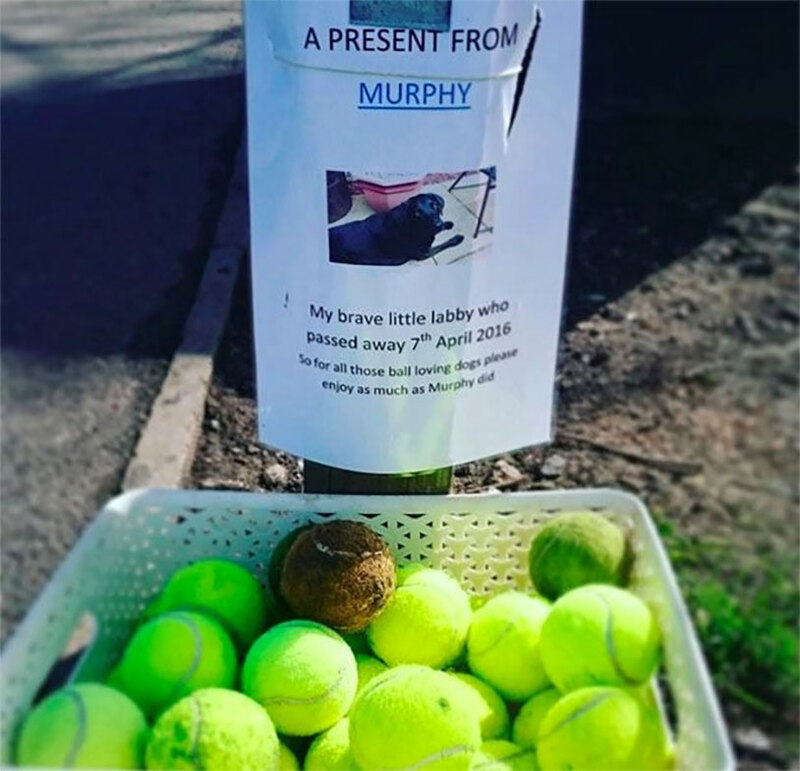 So when Murphy the black lab passed away, his owner decided to honor his memory by giving back to the community. The dog community, that is, with a basket of balls. Black labs love to fetch. They’re genetically predisposed to running after a flying object, grabbing it and bringing it back to their masters. The dogs will do it all day if you let them – and even if you don’t. One park visitor in Barnsley spotted something unusual last week – a basket overflowing with tennis balls, many lovingly chewed, accompanied by a sign. On the sign was a picture of a cheerful looking dog named Murphy, with the caption “A present from Murphy. My brave little labby who passed away 7 April 2016. So for all those ball loving dogs please enjoy as much as Murphy did”. Big ups to Murphy, frolicking in dog heaven, and big ups to Mrs. Barnes. Here’s hoping you can fill that black Lab-shaped hole in your heart with another awesome dog. Thanks for the balls.